How To Launch A Badass Podcast - Four Things You Need! Have you been thinking about hosting a podcast? I thought about it for many months, even went so far as to conceptualize a podcast with a peer of mine before really knowing what I was doing. I was determined to launch it on January 1. There are many platforms out there and if you Google how to start a podcast, you might be overwhelmed with the advice given. My podcast eventually launched later on in January after testing out different methods and getting a routine in place that I was comfortable with. If I had this list, I would have been able to launch on time. So, I want to share with you a few tools you'll need to get started. 1. A USB Microphone - I read a few blogs, asked a few friends and got a number of recommendations on which microphone to use. If you're planning on recording a solo podcast at home like I do and you won't be needing people in your studio (office), you can get yourself a USB microphone. I decided on the studio-quality Cardioid USB Microphone from Audio-Technica. It's on sale for $99 now so I'd scoop up this one ASAP. Pro-tip: Pick up this Dragonpad pop filter to soften your P's when you're speaking into the mic. 3. Podbean - You've got your podcast ready to share but you need a host now.. Soundcloud, LibSyn, Anchor, and Podbean - the options are endless. Yes, you need to have a host because your podcast files are large and you're gonna need to pay someone for server space. 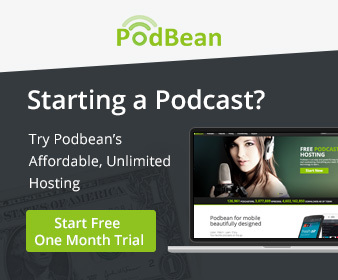 Podbean costs $14/month (as low as $9/month if you pay for a year in advance) and really intrigued me when I saw them respond to a Reddit thread about Podbean hosting. It means they are paying attention to what people are saying. The customer service is top-notch so it gets a recommendation from me. With Podbean, you can generate the RSS feed necessary to share to iTunes and Google easily too. 4. Pond5 - The Pond5 website will give you endless options for intro and outro music. I chose my music early on because it spoke to me and gave off East Coast vibes. There are a lot of sites where they will record an intro for you, but, I like having mine simple and with a beat behind it. These four things are essential for launching your podcast. But, there's much more to cover - What format will you follow? What are the topics you will cover? What's your podcast about? Want to talk podcasts? Schedule a consult with me. "It's OK to be Selfish" - In this episode, @maykingtea chatted about her love of Twitter, helping business owners be more social and being selfish when it comes to getting what you want. May King Tsang is a graduate of Speciality Tea Institute and wants to be known as the world's best Live Tweeter. Tell me I'm not the only one who has favorite British words... Right? Thinking of starting your own podcast? Check out Podbean.